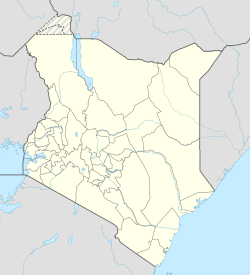 Mokowe is a settlement in Kenya's Lamu County in what was previously Coast Province. It is located on the Garsen–Witu–Lamu Highway, approximately 120 kilometres (75 mi), east of Garsen. It is the last town on your way to the Mokowe Jetty, about 3.5 kilometres (2 mi) away, from where boats leave for Lamu Island and the rest of the Lamu archipelago. The coordinates of Mokowe are 2°14'12.0"S, 40°51'18.0"E (Latitude:-2.236663; Longitude:40.854991). The main health facility is Mokowe Health Centre. The town also has a post office, a police station, a branch of Kenya Commercial Bank and a branch of Postbank Kenya. ^ GFC (9 April 2016). "Distance between Garsen Primary School, Garsen, Kenya and Mokowe, Lamu, Kenya". Globefeed.com (GFC). Retrieved 9 April 2016. ^ GFC (9 April 2016). "Distance between Mokowe, Lamu, Kenya and Kikoni Landing Site, C112, Lamu, Kenya". Globefeed.com (GFC). Retrieved 9 April 2016. ^ Google (9 April 2016). "Location of Mokowe, Lamu County, Kenya" (Map). Google Maps. Google. Retrieved 9 April 2016. ^ Google (9 April 2016). "Aerial View of Mokowe, Lamu County, Kenya" (Map). Google Maps. Google. Retrieved 9 April 2016.